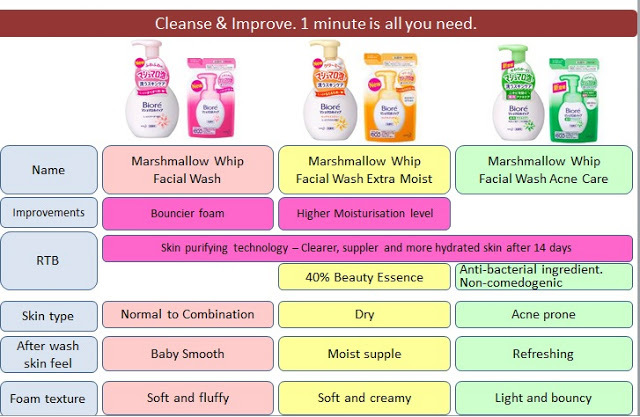 Here is a comparison chart of all 3 facial wash in the Marshmallow whip series! I know that they have the new acne series. But currently I have my trusty DRx products for my acne. So I decided to give this face wash a try instead of choosing the acne one. Cute and neat foam in one pump, really no mess at all! 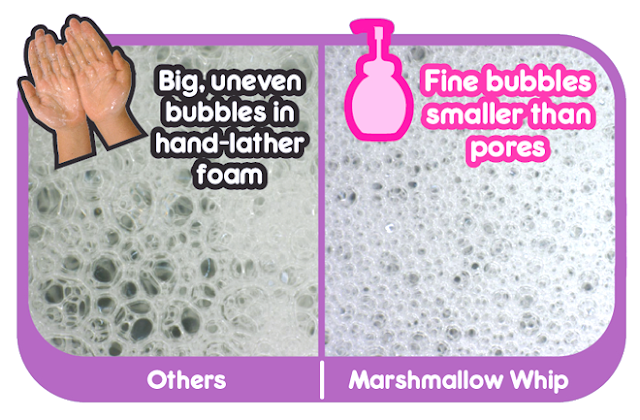 A comparison between marshmallow whip and other foams. I did whatever I could with the foam, took photos with my palm facing down etc. But... the foam still remained intact! Not a single bit came off. These photos were taken 5minutes after doing all sorts of things to the foam. The foam only slide a little and none came off. That's all for my review. I can't really tell what it did to my skin. But I love the texture of the foam! Those who hate messy facial foams should give this product a try! They have 3 different type of foams in this series.